Editor’s note: This story was updated Monday morning after The Evergreen State College clarified some information released Sunday about a law enforcement review of new “external threat information.” Evergreen spokesman Zach Powers said Monday there was no active or imminent threat to campus, despite classes being canceled. 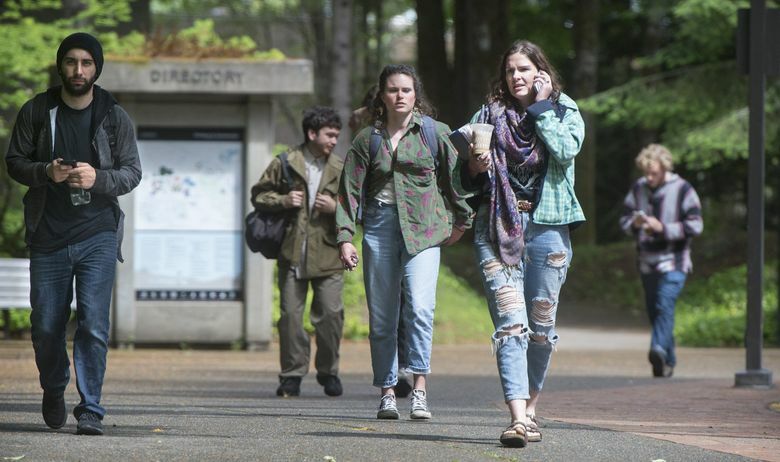 New information received by The Evergreen State College in Olympia over the weekend canceled classes on the campus yet again on Monday, the college announced in a statement late Sunday. Police are investigating “new external threat information received over the weekend,” the statement said. All classes during the day and evening are effectively canceled under “suspended operations,” the statement said. Staff will be present to provide services and ensure safety, and law enforcement will remain active at all hours, it added. “A determination on when to fully re-open campus will be made as soon as possible,” the statement said. The weekend development is the latest in a string that has led Evergreen to shut down classes several times in recent days. Classes were canceled part of Thursday and all of Friday last week. The closures came after hundreds of Evergreen students protested late last month over what some student groups and others contend are mounting racial tensions putting students of color at risk. Law enforcement later “determined that no one was actively” posing a threat in connection to that phone call, Evergreen spokesman Zach Powers later said in a statement. Powers late Sunday did not describe specifics about the latest development.